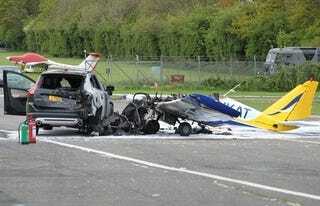 This light plane practically bounced off a Volvo XC60 when it hit the SUV during a crash landing. The Volvo's two occupants were on hand for a drag race at the airport and, after being hit, saved the pilot's life. The incident occurred at the North Weald Airfield in England, where fire crews were already on hand thanks to a drag race taking place on one of the runways. Crews are working with North Weald Airfield's volunteer fire crew to tackle a blaze involving an aircraft and a car. The volunteers were fortunately at the airfield to provide cover to a drag race event so were immediately on hand when the accident happened. At 14:50 hrs, firefighters report that one main jet and foam are being used to extinguish the blaze. Fifty percent of the car, a Volvo X60, and 50 percent of the aircraft, a two-seat, single-engine AT3, are alight. Crews are assisting ambulance paramedics in dealing with one casualty — a man, who is believed to have been piloting the aircraft. No details relating to the extent of his injuries are available at this time but they are believed to be serious. He was taken to the hospital. The incident was dealt with by 15:09 hrs. A fire service spokeman at the scene said "An onlooker who saw the incident told us that the plane appeared to come into land but immediately took off again, banking over the top of a hangar before coming back to try a second landing and clipping the back of a brand-new Volvo with two people inside. [The Volvo was] driving out of the airfield." Station Officer Len Cleary, the officer in charge, said "The pilot was lucky. It appears that the two people in the car brought him clear of the fire after the collision. It is not clear at this stage whether the incident was caused by mechanical failure or human error. The volunteer fire team acted swiftly to cover the scene with a blanket of foam, so when we arrived, the fire was under control. "We have now scaled back our investigation but may return to the scene should the Civil Aviation Authority deem [further] investigation necessary."